You got it Dave. PM sent. I've got some plugs you might want to buy. All real bargains!!!! 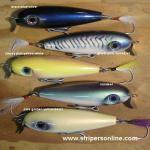 Top lure is a Giant Jointed Pikie in Blue Flash, but the box is for that plug in Black Scale. Values are way down from a few years ago so these are estimates. The bait $20-35 and the box $7 -10. Second bait is Blue Streak and worth $20-30. Check the auction site and you will see most are not even selling for $30. Third bait is Blue Flash and depending on the length a Snook Pikie (about 5 inches) or Giant Pikie (8 inches). The box is wrong for this bait and is for a Jointed Snook Pikie, 5534 and the W means wood. Bait $20-25 and the box $7-10. Red and White again is a Snook Pikie or Giant Pikie depending on size. The box stamped 3434 is for a Snook Pikie in Blue Flash. Values same as above. Sold to Ebb Tide PM sent. Thanks to all. Chumbucket swimmer 5 inches in schoolbus. New unused, no nicks, bumps or bruises. As nice as they come. $55.00 includes s&h and PP fees. I only have 2 or 3 left that are probably 40 years old and I still fish them. Just my 2 cents, but you won’t find a better fish catcher out there than an original Bob Hahn. So they are a foot away from the treasure and the crane operators union goes on strike. You couldn’t write this chit. And now winter is setting in so we will have to wait til next season. Oh the horror!!!!! My apologies to SOL for my mistake. I do know the rules and actually my $100 "offer" was tongue in cheek since I was well aware of the actual value being much more than that. I knew you were holding out. Now show us the rest of them. I am a Ron White fan. Saw him in AC last year. Saw Sebastian in AC also and as mentioned he does a great job especially if you are an older Italian. Saw Rickles years ago at the Copa Cabana. Most of those fish are feeding in the trough right at the lip where the water meets the sand. Utube some John Skinner videos about fishing buck tails and fishing the lip.